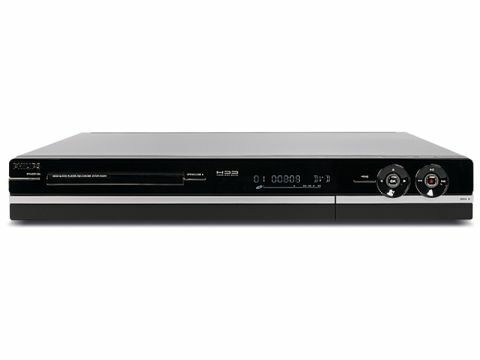 Somewhat more run-of-the mill in styling terms than the quirky Philips DVD recorders of old, the DVDR5520 combines DVD recording with 160GB of HDD capacity, a single digital tuner and HDMI upscaling all the way to 1080p. Also on board are multimedia playback coupled with a 'jukebox' facility; i.Link for dubbing from digital camcorders; automatic HDD 'buffering' of the current programme; and – unique among the recorders tested here – Dolby Digital 5.1 recording. However, the latter isn't as useful as it sounds. First of all, the input is coaxial-only, making it incompatible with the optical-only Sky+/HD hardware, unless adaptors are used. Secondly, 5.1 recordings can't go beyond the HDD. In a nod to our multimedia world, the 5520 incorporates a USB 2.0 port for 'complete file transferability'. In other words, you can copy at will between the DVD, HDD and USB. Digital TV recordings and DVD-sourced material can't, however, be transferred – this feature is strictly for JPEG, DivX and MP3/WMA files on USB or CD/DVD-ROM. Only solid-state USB devices are supported – external HDDs are ignored. The digital tuner is strictly Freeview; there's no CI slot for pay-TV upgrades. There's also an analogue tuner with Nicam stereo sound, but given its pictures are noticeably inferior to the digitally-derived ones it should only be used as a last resort. Setup of these, and the rest of the 5520's functionality, is achieved via 'wizards' and menus that are steady but slow. The same can also be said of general use, which can be frustratingly unresponsive. However, it's better in this respect than earlier Philips efforts. Helpfully, you can record to the HDD while playing a DVD. Recordings – whether manually-invoked, retroactively-captured from the timeshift buffer or scheduled with the 40-event timer – can be dubbed from HDD to DVD at high-speed, but not vice-versa. Basic HDD editing allows recordings to be trimmed-down beforehand. You can't change the recording mode when dubbing, though. On which subject, the 5520 supports DVD-R/+R (single or dual-layer) and DVD+RW/-RW media. The 5520 acquits itself favourably with subjectively crisp and noise-free pictures, from DTT, commercial DVDs and its own recordings alike. The quality 'watershed' is the SPP recording mode, which accommodates 2.5hrs per (single-layer) DVD. Go below this, and the resolution takes a noticeable turn for the worse. Use dual-layer DVDs for longer recordings if quality is important. Upscaling works well subjectively, although the 5520 fails the HQV jaggies test.